I'm gradually sneaking up on the final answer to the challenge I set at the start of this blog. 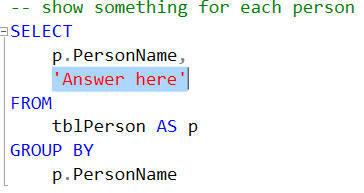 Instead of displaying Answer here, we want to show the list of course ids, comma-separated. Here's what we get for now. A better name? Perhaps not. For our example, we can use the STUFF function to get rid of the opening comma at the start of each list. The output from running the above query. The XML text listing the course ids for this person, with all node names and the leading comma removed. Hopefully this now makes sense!